At the north-western corner of the village, and on the highest ground, stands a magnificent Temple of Edfu , which, though seen after Dendera and Temple of Dendera , and inferior in size to that of Karnak, is said to yield in effect to neither, the mole and entrance being particularly noble. Numerous brick huts have been erected upon the top of the temple of Edfu , in the peristyle, and in front of the propylon, so as to render access to it difficult every way. The propylon is in the form of a truncated pyramid. 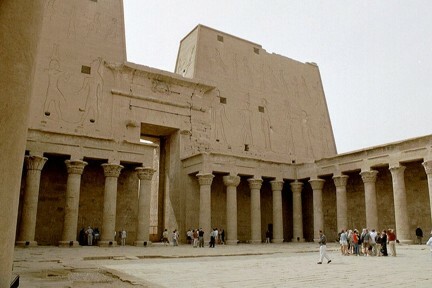 Edfu Temple, entrance court is at once the most imposing and one of the best proportioned in Egypt. From a base 90 feet in length by 30 feet in width, it rises up on each side of the gateway, ‘like two square towers without embrasures’, gradually narrowing till, at the height of 100 feet, it measures on the flattened top only 75 feet by 18. Handsome stairs lead from the gateway on either hand to the different chambers and to the summit. Over the entrance is the globe with the serpent and wings, and on each side is sculptured on the wall a colossal figure of Isis, attended by the hawk-headed deity and another colossal figure armed with a hatchet. Within the propylon is an open court, or dromos, enclosed with high walls covered with sculpture, and adorned with a peristyle of eleven columns, besides five on each side of the doorway, all covered with sculpture. The pronaus, at the northern end of the court, has six columns in front, with varied capitals, resembling the leafs of the doum, or Thebaic palm, the leaf of the date-tree and the budding lotus. The winged globe and serpent occur again over the door, and are frequently repeated on each side, with other strange devices of beetles, long-tailed monkeys, etc. A moulding passes down the comers of the temple, the same as at Dendera and Esneh, so as to include the whole in a frame. Within the pronaus are two rows of columns, three in each row, loaded with hieroglyphics and devices; the globe with wings are painted along the centre of the ceiling, and each inter- columniation has its peculiar ornament; but there is no zodiac. On the walls, Osiris, Isis and Horus are receiving offerings. The entrance to the cella is quite blocked up with sand and rubbish.